Visit the 2015 Home Builders Association of Greater New Orleans’ Parade of Homes at The Parks of Plaquemines! The private neighborhood is carved from a wooded area just off of Woodland Highway (State Route 406), minutes from the Intracoastal Bridge. 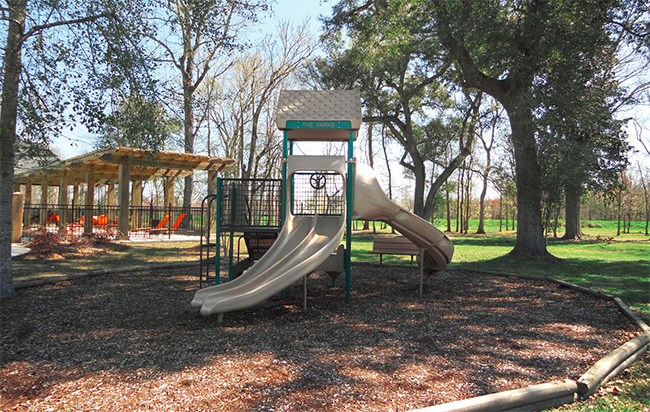 Aptly named for its rustic, organic surroundings, The Parks of Plaquemines features natural amenities like parks and wide open green spaces, as well as man-made amenities. A fully engineered, planned walking trail system surrounds the entire community. There’s a tot lot playground, complete with tire swing, and a community pool with cabana. The well-appointed, gated entrance and streets throughout the community have lovely finishing touches like matching mailboxes and quaint streetlights. A welcoming and charming curb appeal is evident to even the casual, first-time visitor. For the homeowner who acknowledges the importance of both the bottom line and the lifestyle, The Parks of Plaquemines is situated just across the Plaquemines Parish line in an area with lower tax rates, levee protection and excellent schools. FEMA has designated The Parks as Flood Zone C with solid savings on rising insurance rates. In fact, it’s hard to imagine a better investment and value for one’s home buying dollar this close to the New Orleans metro area. Under the direction and guidance of Developer David Waltemath (who is widely known for his work in English Turn, The Estates of Northpark and Bedico Creek), The Parks of Plaquemines has a solid growth plan and is an upscale, master-planned community. 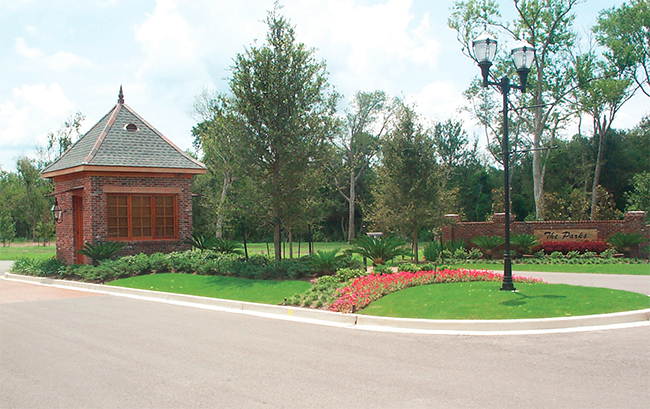 The Parks offers two types of home sites – Traditional Neighborhood Lots and low-maintenance Garden Home Lots. Traditional lots come in many different sizes and are suitable for family-sized or estate homes. Views vary from private nature views to water and lake views. Garden home lots are offered together in The Villas section. All home plans are required to be traditional Southern architecture and must be reviewed by professionals on the Design Review Committee prior to construction. Garden home lots are priced from the low $70’s to the low $80’s. Lot sizes are typically about a quarter acre. Low maintenance garden homes range from 2,000 square feet of living area to over 3,000 square feet and range in price from the mid $350’s to over $500,000. These luxurious homes are appointed with gorgeous interior and exterior amenities. So, if you’re pondering the options for a well-developed, aesthetically appealing neighborhood with great lot choices, beautifully crafted homes, and amenities not found in any other subdivisions close to it in Plaquemines Parish, be sure to visit The Parks of Plaquemines. The Parks will be showcasing a spectacular $1 million+ home in this year’s Home Builders Association of Greater New Orleans Parade of Homes. 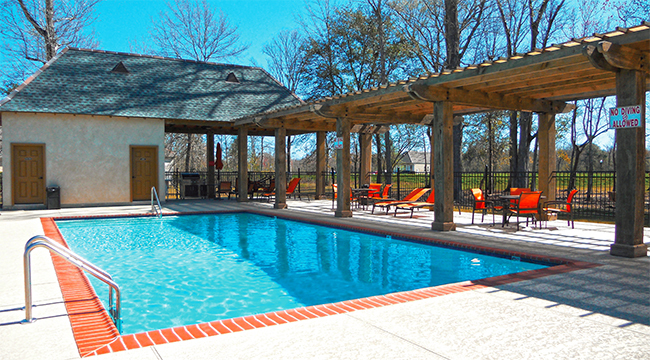 Don’t miss the opportunity to explore this charming community. 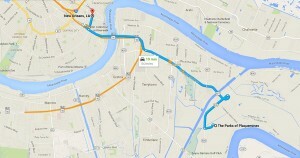 See for yourself the beauty, the convenience, and the value of building or buying at the Parks of Plaquemines. Bring your Realtor, if you like, they’re always welcome at The Parks and they value their long-term relationships with the real estate community. More information about the best of both worlds near Belle Chasse, Louisiana is available by e-mailing Info@TheParksLifestyle.com or calling 504-364-2350.